2000AD comic Prog #474 (14th June 1986) | 'TAIN'T THE MEAT… IT'S THE HUMANITY! This sure as drokk ain’t the Judge Dredd we all know and love! Dated 17th June 1986 Prog #474 of weekly British sci-fi comic 2000AD featured cover artwork by the incomparable Kevin O’Neill. There’s trouble brewing in the Cursed Earth as a lunatic mutant impersonates Dredd, dishing out quick and lethal justice to the unlucky citizens of Radburg. 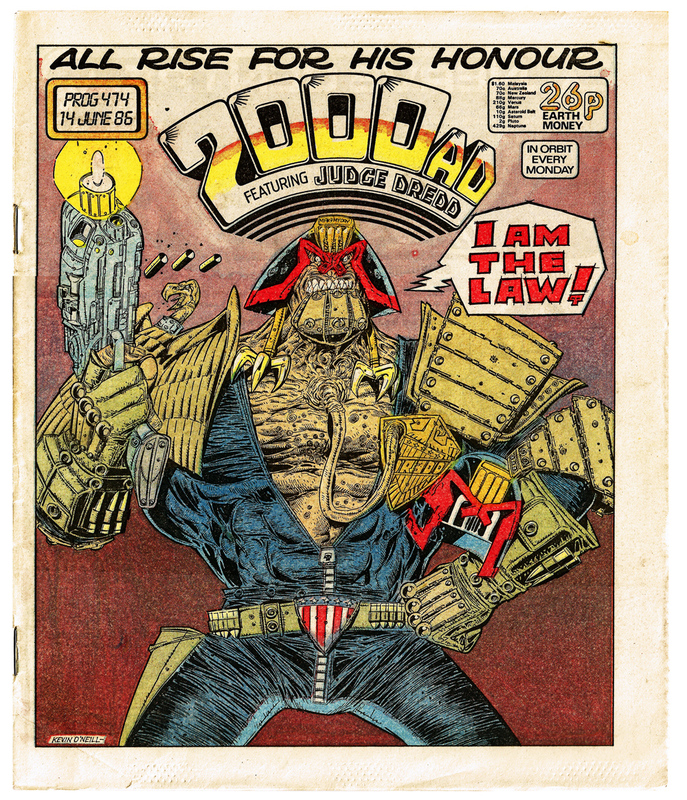 When Dredd appears to restore the status quo things get ugly, almost as ugly as the mutant himself – depicted in all his wonderful, bonkers glory by O’Neill. This cover is terrific, easily one of O’Neill’s best — I love the mutant’s (he’s never actually named) bolted-on iron chin, as well as the vulture shoulder pad. And the strip of skin connecting his badge to his chest is deliciously warped. Sadly, despite the great cover, the rest of Prog #474 is pretty mediocre. The issue kicked off with another instalment of the story The Possessed featuring Judge Anderson (click here for a closer look at Prog #472 which featured her on the cover), followed by hum-drum strip Bad City Blue. An reprint of an old Alan Moore penned Tharg’s Future-Shocks was up next followed by the Dredd story, which naturally received the coveted four-colour centre spread treatment. Next up was another instalment in the Strontium Dog story rage followed by the single page Sooner or Later that ran on the back cover. Between Prog #474 seeing print and January 1987 O’Neill contributed half a dozen more eye-catching covers to 2000AD comic. I’ve already looked at a couple (click here) and I’m going to take a closer look at the others over the next few weeks.